The ability to easily upgrade various parts of your AR-10 is one of the features that makes it popular for hunters, competitive shooters, and law enforcement alike. Having the right trigger allows you to improve your accuracy and results in a superior shooting experience. Every shooter has a different preference for the pull weight required to squeeze the trigger, as well as for the way it ‘breaks’. In this article, we will talk about the benefits of upgrading your trigger, how to go about selecting the trailer and recommend some top triggers for your AR-10. Upgrading your AR-10 trigger can be a sound upgrade. Until you’ve tried a high-quality trigger and feel the difference, you’ll never really know. The best triggers will ‘break’ without any warning, hence improving your accuracy because you cannot flinch to anticipate the recoil of the shot. It also makes you a better shooter as you’re not thinking about the trigger break, but more focused on the task at hand. Another proof a trigger is good is that it doesn't have to be pulled back a long way before it "breaks" and fires a shot. This short travel prevents the application of excessive force which can lead to inaccuracy. The short travel has the additional benefit that resetting for a next shot is quicker, so you can put more accurate rounds downrange. One of the most asked questions about the AR-10 is whether the trigger for this rifle and the AR-15 are interchangeable. The fact is, most AR-15 triggers will physically fit and function in a current AR-10 rifle. But that’s not the whole story. The difference in AR-10-specific triggers is the military primers. The primers in military ammo often require more energy to ignite the primer than .223/5.56 ammunition, so these triggers typically have a heavier hammer and a more powerful hammer spring. So, while you could use your AR-15 trigger in the AR-10 and vice versa, it would affect the reliability of the trigger, as well as the feel of it. 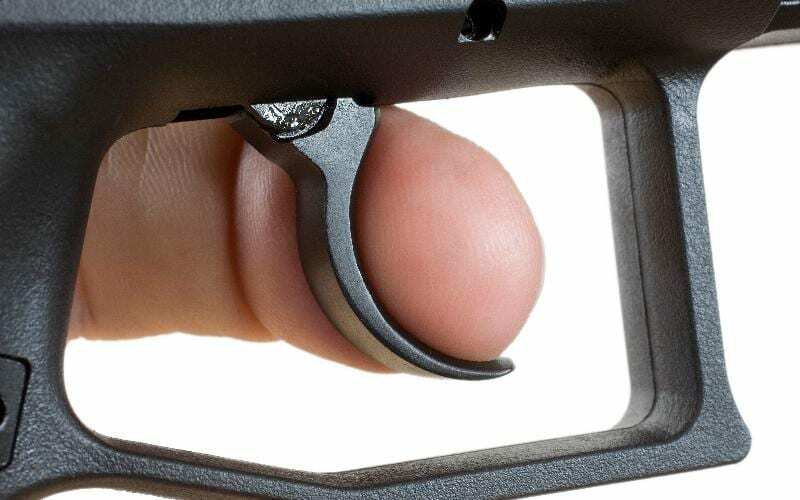 Our recommendation is to always use triggers made specifically for the AR-15 or the AR-10 in each gun respectively. This will ensure total reliability and the right pull on the trigger for your shooting comfort. What Makes a Great AR-10 Trigger? A good trigger will be both safe and fit the gun well. Let’s talk about these two factors to help you understand what to look for in your AR-10 trigger. Obviously, safety is your first concern. Due to the heavy recoil, you need a trigger that doesn’t have a too light pull, as it can be dangerous to you as well as those around you. It is commonly recommended not to go lower than 4# and if possible to use a two-stage trigger. Most triggers have a curved area that fits your finger, but on some triggers it's flat. Whichever you choose, it's up to you. The second factor to take into account is the fit. Some triggers require modification, resulting in interference with the bolt carrier. You should stick with triggers that are designed for the AR-10 and designated to do so from the trigger manufacturer. If you are unsure, contact the trigger manufacturer or seek the help of a qualified gunsmith. When upgrade your trigger, look for a drop-in kit that can be installed in minutes. Having this luxury will save you from the frustration and agony of working with tiny trigger springs and other parts. Now that you know more about triggers for an AR-10 and what factors must be considered when buying one, let’s look at our recommended triggers. These triggers offer great value for money and are top-ranked for their quality, functionality, and ease of installation. 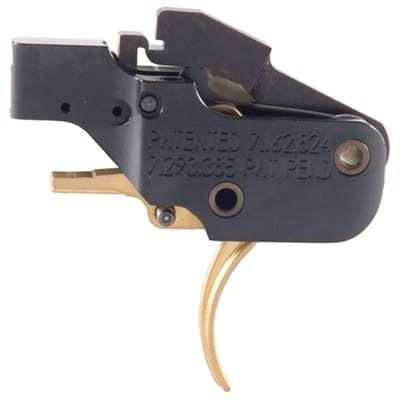 This is an excellent 2-stage combat trigger with a fixed 4½ lb total pull weight, non-adjustable sear engagement, and additional safety features. A “safety sear” ensures that the rifle can fire only when the shooter actually pulls the trigger. The trigger pull is optimized for both deliberate, aimed fire, and quick shooting. The first stage builds gradually to 2½ lbs.. With a 2 lb., the second stage breaks clean, so the shooter can stay on target throughout the pull. A lightweight hammer driven by a full-power hammer spring delivers positive ignition of all ammo types. Moreover, it can be installed without removing the safety. 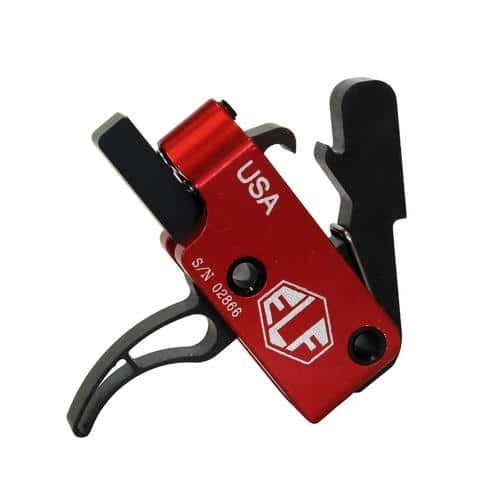 The SSA-E’s reduced first and second stage pull weights result in a trigger with a smooth, light first stage take-up and a crisp, candy cane-like second stage break. The SSA-E trigger is ideal for use in precision rifles where weapon accuracy and reliability are critical. 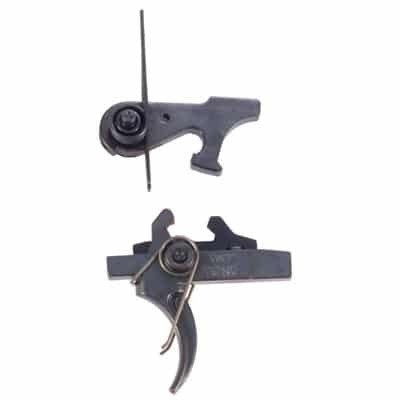 This is an ideal drop-in trigger for target shooting, snipers, and hunters. Due to its crisp, candy cane-like break, and smooth pull, this is a top option for many. 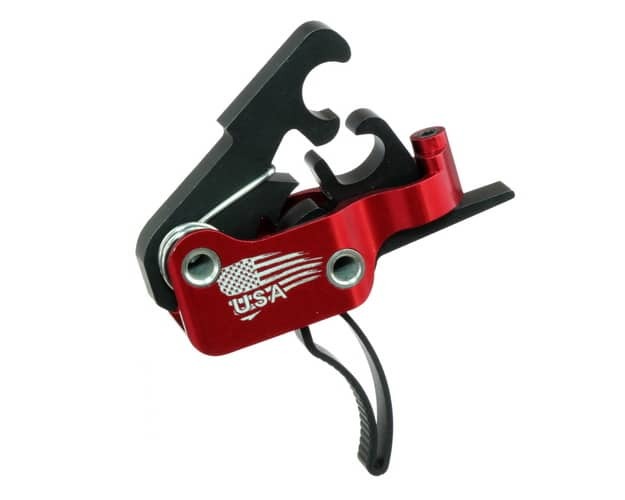 This is an easy-to-fit, fully adjustable trigger and is available with pull weight as light as 3.5 lbs. It‘s designed and machined to deliver a consistent let-off and to prevent the kind of wear that causes doubling and other problems. It has an extremely short reset for fast follow-up shots. You can install it in minutes while keeping your current hammer and pins. 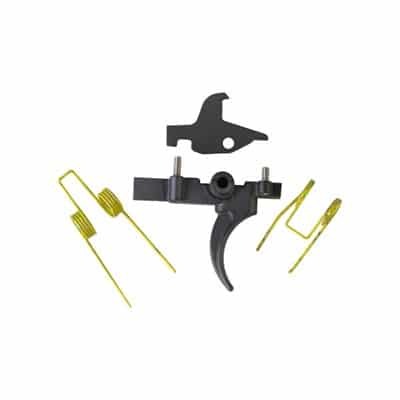 The disconnector spring, engagement screw, and overtravel screw are already installed; and the trigger kit also includes a disconnector, trigger return spring, hammer spring, and .050" hex key. The standard weight hammer spring gives a trigger pull of between 3 and 3.5 lbs. that is suitable for competition and recreational shooting, while the “tactical” spring gives a 3.5 to 4 lb. pull for high levels of ignition reliability. The fast reset means quicker follow-up shots, giving you a critical advantage on tactical and competition rifles. This model comes with two kinds of springs so you can adjust the trigger according to your requirements. The drop-in trigger module is designed for an exceptionally smooth, crisp, creep-free single-stage trigger pull. It requires no gunsmithing, fitting, or adjusting, and all components are inside the lightweight, aluminum alloy housing. With this, it’s installed using your rifle’s original hammer/trigger pins. The hammer is machined from S7 tool steel, while other components are cut from A2 tool steel, and heat treated for long service life. This trigger has a factory-set 4 lb. pull weight, a solid shoe, and more hammer mass to ensure ignition of harder primers. Thanks to the great quality control for which Timney is known, you can rest assured knowing your trigger will work perfectly as soon as it is installed. 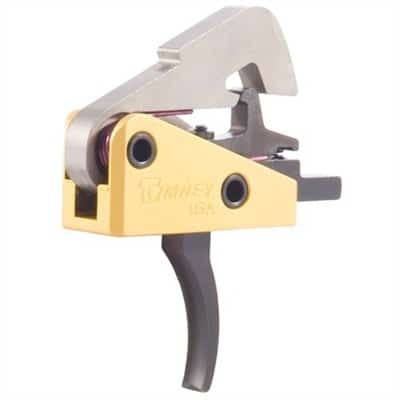 The two-stage gold trigger is adjustable from 3 to 4-½lbs, features an ultra-short reset and was designed with the precision shooter in mind. It installs in minutes and delivers a light, smooth, match-grade trigger pull. It’s a drop-in module and uses the factory selector and pins. The design is adjustable for sear engagement, with a first-stage take up of approximately 6 ounces, followed by actual sear movement taking up the rest of the weight. In addition, the Gold system uses the rifle’s factory safety to positively capture the hammer and roll it back below the primary sear for extra safety. The housing is lightweight aluminum and the hammer and sear are cut from S7 steel. The assembly is cut with a precision CNC machine and is hard anodized. While the trigger’s first-stage take up is different from the standard military AR trigger setup, it gives a crisp and clean break, making it a very good choice for AR-10 owners of all types. The single-stage design of the Jard trigger improves trigger feel and function. The sear and disconnector engagement, overtravel, and safety movement adjustments allow fine-tuning for ultimate crispness. Along with a clean-breaking, 2 or 3 lb. pull weight. The engagement surfaces are hardened to prevent wear and for greater durability. Jard also offers AR replacement springs that allow you to customize the trigger pull of your rifle according to your taste. While the single-stage design is not as tunable as a two-stage trigger, it does allow fine-tuning for a clean break that you can enjoy every time. Loctite, padded clamp, strong solvent, compressed air, plastic mallet, old firing pin or military push pins, belt sander. For a drop-in trigger, installation can be very easy and involves just a few basic steps. Always practice basic safety and ensure the gun is fully unloaded when working on it. 1. Remove the takedown pins and remove the upper assembly from the lower assembly. 2. Place the lower assembly in a padded clamp and degrease all the parts. You can use the solvent and pressurized air for this purpose. 3. Remove the old trigger group. 4. Insert the new trigger cartridge in the trigger well of the lower receiver. 5. Carefully insert the trigger pins using the plastic mallet without letting them fall out. 6. Install one allen screw in each side of the trigger cartridge so that they extend through the bottom of the cartridge and push the trigger cartridge up, putting light binding pressure on the pins (this is what holds the pins in). 7. Install one allen screw on top of each of the allen screws from the previous step. The second screws are the lock screws to keep the first set of screws from backing out. 8. Finally, test the trigger installation for proper function. Upgrading your trigger does not require much prior experience in gunsmithing or technical know-how. You can't go wrong with any of the top triggers that we have recommended in the list above. Remember to take into account the various factors like safety, pull weight, and fit when selecting the trigger that you want to purchase for the AR-10. 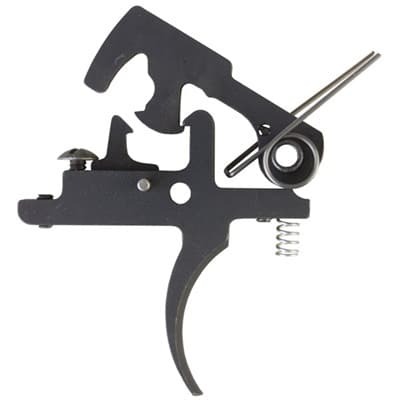 Your new trigger should make shooting your AR-10 more natural and comfortable while upping the accuracy as well. We hope this review has been helpful and contributed toward you next AR-10 trigger. If you choose a model from our list above, be sure to visit us again soon and fill us in regarding your experience.